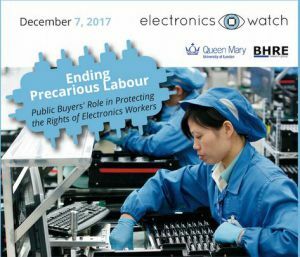 This event, taking place the 7 December in London, will focus on precarious labour in the electronics industry and explore ways in which public sector buyers can help protect the rights of workers in unreliable and often abusive forms of employment. As in previous years, the Conference will feature leading practitioners in the field of socially responsible public procurement, experts in international labour rights, and grassroots workplace monitors from electronics production regions around the world. Electronics workers in precarious forms of employment earn low wages, work unpredictable hours, may not be properly trained for hazardous work, and risk losing their jobs and sometimes residency permits should they speak up for their rights. They may be employed legally or illegally, directly or indirectly for the factory where they work. They may be migrants or local workers, student workers or trainees, and work in any country. Electronics Watch highlights the challenges of precarious work in factories that make the electronic goods public sector organisations buy and helps to develop solutions that involve local civil society organisations, trade unions, electronics brands, and factories. If you wish to register and for more information, visit the event’s page.